Thanks, Uncle Sam! A huge financial crisis, which could have rippled through the global economy, has been somewhat contained by the intervention of the US government. 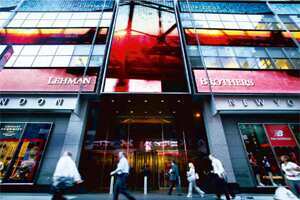 The collapse of Lehman Brothers Holdings Inc. caused stock markets worldwide to plunge on concern that there is more of the same to come, and the crisis threatened to have a cascading effect on foreign exchange and commodities markets as well. It was essentially a crisis of confidence, which was immediately reflected by the sharp spike in the US inter-bank lending rates because of fears of credit constraints in the global financial system. The extraordinary steps taken by the US government have, to an extent, controlled the damage and reinstilled some confidence in the system and the markets. However, one should not make too much of the recent surge in global markets, which is likely to continue in the initial part of the week as well, as it is primarily due to short covering and some bargain buying. Other than the sweeping US government measures to rescue the financial system, the joint action by the US and the UK to ban short-selling was an important reason for the rebound. The ban not only restricted fresh shorts, but forced short-sellers to cover their positions, which led to a surge in financial stocks. Back home in India, the markets moved up due to buying by domestic funds and short covering by investors as foreign funds continued their selling spree. Data available from the Securities and Exchange Board of India show that foreign funds remained net sellers of $1.88 billion (about Rs8,700 crore) so far this month and in the first four days of last week (till Thursday; Friday’s data will be available on Monday) they sold heavily in the equity market. The crux of this analysis is that the current spurt is only a relief rally and major investors will not be in a hurry to return. Since economic fundamentals globally are still the same and oil is back to $103.9, these factors will be back in the reckoning once the euphoria over the US rally fades and investors seek answers to the question — What next? Technically, the markets are more or less in line with expectations. In Tuesday’s special column of Ahead of the Ticker, I predicted that the markets would fall until Thursday, and recover on Friday. So, Friday’s rally was not a surprise technically, except for its magnitude, which was largely because of global factors. This week, too, the markets are set to gain in the initial part of the week due to the continuing momentum, but would witness some profit-selling in the latter part. In terms of the Sensex index of the Bombay Stock Exchange (BSE), the immediate trend is positive and it indicates further gains. This time the closing of the Sensex above 14,010 points is a positive. Now, on its way up, the Sensex is likely to test its first resistance level at 14,285 points, which is a moderate level. If this resistance is breached (probability 85%), then the next resistance level would come up at 14,612 points. However, if the Sensex closes above this level, then the next important resistance level would come up at 15,039 points, which will in a way decide the short-term trend on the bourses. A close above this level would ensure further gains, with the next key resistance coming at 15,271 points followed by a critical resistance level at 15,598 points. If this level is breached, then there would be a sustained bull run. On its way down, the Sensex may test its first support level at 13,789 points, which is a moderate one. If this level is breached, the next support level would come up at 13,585 points, which is a critical one, and a close below this would mean a bearish undertone and further falls, with the next support coming up at 13,341.45 points, followed by another at 13,132 points. If the Sensex closes below this level, it would signal a severely bearish undertone, with the next support level at 12,551 points. In terms of the Nifty, the first resistance level is expected at 4,293 points, which is a moderate level. If the Nifty closes above this level, then the next crucial resistance is expected around 4,359 points. This level may help in deciding the short-term outlook for the market. A close above this level would suggest bullish sentiment with the next level of resistance expected around 4,449 points. A close above this level would strengthen the trend with a deciding resistance level at 4,525 points. Among sectoral indices, for the BSE Mid-Cap, there is deciding resistance at 5,533 points and a support at 4,872 points and a close outside on either would determine the trend. The BSE Small-Cap index has a trend-deciding resistance level at 6,706 points and support coming up at 5,887 points. Among individual stocks, Sterlite Industries (India) Ltd, Infosys Technologies Ltd and Union Bank of India look good on charts. Sterlite Industries, at its last close of Rs468.50, has a target of Rs490 and stop loss of Rs443. Infosys Technologies, at its last close of Rs1,624.95, has a target of Rs1,667 and a stop loss of Rs1,582. Union Bank of India, which closed last week at Rs151.5, has a target of Rs159 and stop loss at Rs141. From the previous week’s recommendations, despite high volatility on the bourses, Tata Motors Ltd touched a high of Rs436 and met its target of Rs428 easily. Bharti Airtel Ltd touched a high of Rs820, well above its target of Rs797, while Union Bank of India touched a high of Rs155 and missed its target of Rs158 by a whisker and is a part of the current recommendations.